The Precis-BX306 GNSS RTK Board. Tersus GNSS photo. 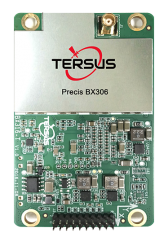 Tersus GNSS, Inc., a GNSS RTK manufacturing company based in Shanghai, China, recently launched its new GNSS RTK Board, the Precis-BX306. Featuring 192 GNSS channels, the launch of Precis-BX306 aims at facilitating the applications which need centimeter positioning accuracy and dynamic operation mode, enforcing effective observation data logging and management, and popularizing the adoption of high precision in aerial mapping and drone-related integration. Compared with previous Precis GNSS RTK boards, Precis-BX306 further improves the reliability and continuity of positioning performance in challenging environments as it supports GPS L1/L2, GLONASS G1/G2, BeiDou B1/B2 with 192 tracking channels, according to the company. 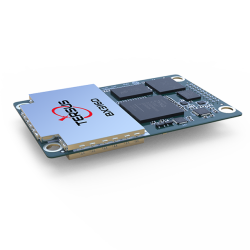 It is designed to easily integrate into Pixhawk and other autopilots, and with a compact design (46 millimeters x 71 millimeters x 12 millimeters) and low power consumption. The event mark and PPS features provide more possibilities for shutter synchronization. More information on Tersus GNSS products can be found on the company’s website: https://www.tersus-gnss.com/.